Helps with diabetes– Turmeric can moderate insulin levels, when taken with diabetic medications it enhances their effects and improves glucose control. It also reduces insulin resistance which can help prevent onset of type-2 diabetes. Be aware using it with other mediactions can result in low blood sugar, consult your doctor before taking it. Strengthens Bones– This is a well-known trick to strengthen bones, you may have seen older people giving turmeric milk to those who have had an accident to help them recover quickly and for stronger bones. Fights Diarrhea– Turmeric can help treating diarrhea. Don’t mix it with milk because of the high-fat content. it may exacerbate the diarrhea. Germany has approved this herb for fighting indigestion and diarrhea. Cancer– If you are struggling with prostate cancer this is the right herb for you. Turmeric helps prevent prostate cancer and stops the growth of existing prostate cancer cells and has the ability to destroy cancer cells. Researchers have approved it’s use for protection against radiation-induced tumors. Relieves Arthritis– Because of the anti-inflammatory properties in turmeric it’s great for osteoarthritis and rheumatoid arthritis. Turmeric destroys free radicals in the body that cause damage to cells. It has been noted that those suffering from rheumatoid arthritis who drink turmeric milk regularly for a longer period, felt relief in their joint paints and inflammation. Lowers Cholesterol– Maintaining healthy cholesterol is important, high levels can cause severe damage. Research has found that frequent use of turmeric, even in regular foods, may help you maintain healthy cholesterol levels. Mixing it with milk enhances the effects and reduces serum cholesterol levels. Boosts Immunity– Turmeric helps boost and stimulate the body’s immune system due to a substance in it called lipopolysaccharide, which decreases risk of catching cold, flu, and fever, from the antiviral and antibacterial properties found in it. 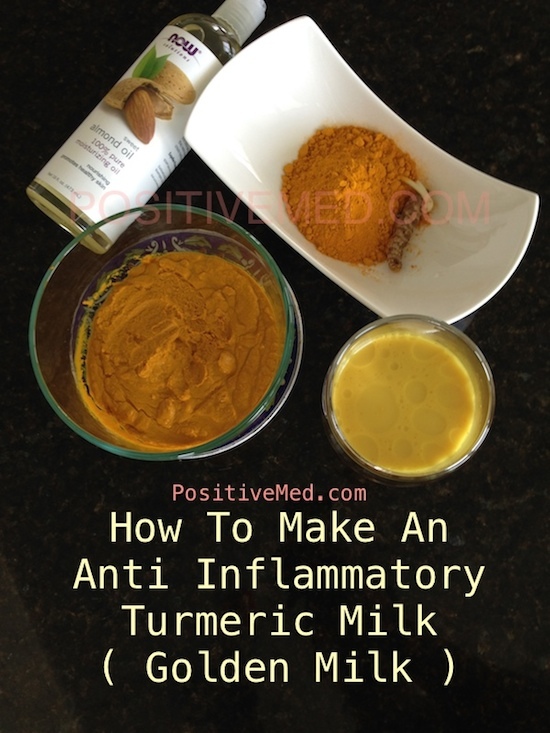 Next time you get sick mix some turmeric in a glass of warm milk and drink it up. Heals wounds– Turmeric has antiseptic and antibacterial properties which serve as an effective disinfectant, it can do wonders for cut and burns. Drink a glass of turmeric milk daily to heal your skin. It repairs damaged skin and can also be used to treat psoriasis. Weight Management– Good news for those who want to lose weight, turmeric milk can help you maintaing your ideal weight. Turmeric use increases the flow of bile which is an important component to break down dietary fat. Those suffereing from obesity should drink it daily. Helps Prevent Alzheimer’s Disease– Use turmeric milk to treat brain inflammation, which is the major cause of cognitive disorders like Alzheimer’s disease. It supports healthy brain function by removing unwanted plaques that form in the brain, thereby improving oxygen flow. Turmeric Paste – Add ¼ cup turmeric powder to 2 1/2 cups of water, stir. Bring mixture to boil and keep stiring until it becomes a thick paste. If it gets too dry add a little more water. Once done cool and keep in an airtight container in the refrigerator for about a month.